Do you always seem to catch your teen or tween stealing goodies from your subscription boxes? Why not get them a subscription box of their own this year? We considered 1000s of subscription boxes and came up with this list of our favorite ## subscriptions for teens. These boxes offer up age-appropriate apparel, accessories, makeup, and gifts that teens and tweens will actually think are cool. Plus, there’s something for every type of teen, from YouTube beauty vloggers to comic-book-collecting superhero superfans, and every type of budget. Birchbox offers curated boxes of must-try beauty and grooming samples for girls AND guys, too! Everything’s personalized to your teen’s tastes and preferences, so they can expect fun new finds that fit their specific needs each month! Grab a grooming or beauty gift subscription to get them started. $10 per month (or get a month free when you sign up for an annual subscription). Ships to US, France, Spain, the UK, & Canada. Check out our Birchbox reviews! Ravenous readers will love the YA novels AND the book-inspired surprises inside this monthly box. Teens will get exclusive goodies for their room and desk, cool collectibles, and literary extras like bookmarks and notes from the featured author. The standard OwlCrate box is aimed at teens and college-age readers, but they also offer OwlCrate Jr., which is specially curated for 8-12 year olds! Gift the subscription level that fits your favorite book lover. $29.99 per month + shipping. Ships to US ($7.99 per box), Canada ($10.59 per box), and worldwide ($19.99 per box). Check out our OwlCrate reviews! COUPON: Use code WELCOME10 to save 10% off your first month! Is Sephora your teen’s favorite stop at the mall? Get them a subscription to Sephora’s monthly subscription box, which comes packed with samples of coveted products from beloved and up-and-coming brands. This box isn’t specifically created for teens, so a few more grown-up products (think eye cream or anti-aging serums) might sneak in from time to time. That said, Sephora tailors what they send to the preferences in each subscriber’s Play profile, so you do have some control. The best part of this subscription? Each box comes with a Play! Book of tips and a Play! Pass that you can bring into your local store for a 1-on-1 tutorial + 50 Beauty Insider points! Gift a box by entering your recipient’s shipping information during checkout. $10 per month + free shipping. Ships to US only. Check out our Play! By Sephora reviews! Is there anything cuter than Pusheen, the internet’s favorite cartoon cat? How about a quarterly subscription box full of exclusive Pusheen-themed goodies?! This subscription has a slightly higher price point, but we think you get your money’s worth in each delightfully unique seasonal collection. Each box contains sooo much to smile about, like wearables, decor, personality-packed figurines, stationery, desk accessories, and even small electronics. Aiming to make your gift-getter squeal with joy? Sign them up for a subscription to this box! $43.95/quarter + shipping. Ships worldwide. (Rates vary by country.) Check out our Pusheen Box reviews! Hey, we all remember our awkward middle- and high-school days. Getting into a good grooming routine isn’t always easy! But with a subscription to Dollar Shave Club, your teen will be looking dapper and feeling confident in no time. Each month, they’ll get an assortment of high-quality razor blades plus any add-ons they need, like shampoo, shaving cream, and more. Get them started with this great self-care subscription! Plans start at $1 + shipping. Ships to US, UK, Canada, and Australia. Check out our Dollar Shave Club reviews! Cute, colorful, cheeky, delightful—you’ll find all that and more in each installment of Quirky Crate! From socks and accessories to playful purses and home decor, your teen or tween will find plenty to smile about in this subscription box. Each box is guaranteed to include a pair of super unique socks and an enamel pin designed by an indie artist. Beyond that, it’s an awesome surprise! Sign your teen up for this bountiful box, or choose the stocking-stuffer-sized 3-item Quirky Post box instead! $34.99 + shipping per month. Ships to US ($5.95 per month), Canada ($13.95 per month), Mexico ($19.95 per month), and worldwide ($20.95 per month). Check out our Quirky Crate reviews! COUPON: Use code UNICORN10 to get 10% off! Up your leggings game with oh-so-cozy and cool styles from Enjoy! These snuggly leggings are perfect for school, hanging out on the weekend, or spending a lazy Sunday doing homework on the couch. Enjoy caters to sizes 2-18 and donates a portion of their proceeds to charities that help promote positive body image. We love a gift that gives back! $16.95 per month. Ships worldwide. (Rates vary by country.) Check out our Enjoy Leggings reviews! Loot Crate is a must for teens who can’t get enough pop culture! The original Loot Crate box covers every fandom imaginable—we’ve gotten gear from Deadpool, Batman, Adventure Time, Stranger Things, Rick and Morty, Guardians of the Galaxy, Bob’s Burgers, The Simpsons, Nintendo games… the list goes on! Know a specific franchise your teen loves? Check out the wide array of themed subscription boxes Loot Crate offers around things like Marvel, Harry Potter, Sanrio, and even the WWE! $19.99 + $5 US shipping. Ships worldwide. Check out our Loot Crate reviews! Crafty kids will love the monthly projects they get from Doodle Crate! Each box includes everything you need to create a unique DIY project, such as candle-making, book-binding, or fiber art. Everything is tailored to the skills and interests of 9-16 year olds, so it’s a great pick for creative tweens. $19.95 per month. Ships to US (free) and Canada ($6.95). Check out our Doodle Crate reviews! COUPON: Save 40% off your first box when you use this link! If you think socks are a boring holiday gift, think again! Say It With A Sock is changing the game with bold, colorful, head-turning socks from awesome brands like Stance Socks, Richer Poorer, and Happy Feet. Choose a one-, two-, or three-pair-per-month subscription and whether you’d prefer socks patterns or graphic designs, and set your teen or tween up to receive a sweet new shipment of comfy socks each month! Subscriptions start at $11.99. Ships to US, Canada, UK, Australia, Ireland, Belgium, Finland, France, Germany, Luxembourg, Netherlands, Spain, Denmark, Norway, Sweden, Austria, Italy, Switzerland. Check out our Say It With A Sock reviews! If your teen goes to school away from home, treat them to a care package courtesy of CampusCube! This subscription curates a monthly mix of cool gifts, yummy treats, and personal care finds for your girl or guy. Help them feel special and remember to make time for self-care throughout their busy school schedules! $39.95 per month. Ships to US only. Check out our CampusCube reviews! Help your teen stock up on cool accessories with this monthly bracelet subscription! Each monthly package includes three boho bracelets from the Pura Vida collection. The best part? Pura Vida supports 350+ artisans worldwide and has donated over $1.5 million to different charities! $14.95 per month. Ships to US (free) and worldwide ($5.00 per box). Check out our Pura Vida Bracelet Club reviews! Ipsy is one of our readers’ most-loved beauty and makeup subscriptions! Each month, your teen will get a personalized assortment of sample- and full-sized products from big-name and up-and-coming brands. They’ll get skincare, makeup, and even hair products to love. It’s a great way for makeup newbies to explore fun products to express themselves with! Plans start at $10/month. Ships to US and Canada. Check out our Ipsy reviews! Wonderful Objects is a quarterly subscription service that brings imaginary adventures to life. 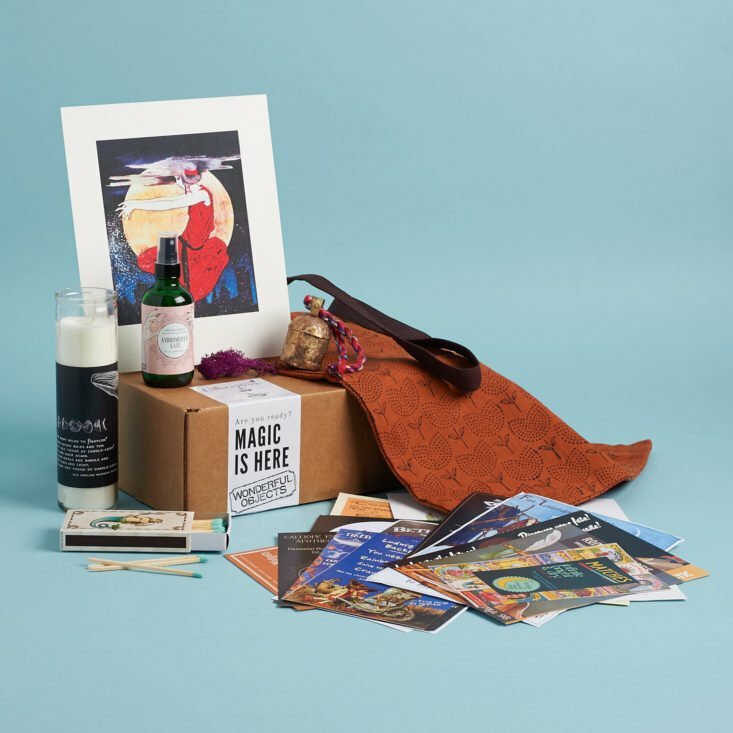 Each box puts forward a fantasy premise, then presents a series of gifts and custom ephemera that bring that premise to life. Time travel, monster hunting, bending luck—teens will love the fantastical worlds created by this immersive box! $54/quarter. Ships to US and internationally. Check out our Wonderful Objects reviews! COUPON: Use code WONDERADDICT10 to save $10 off any subscription!